This To Go Tumbler is a portable, stemless wine GLASS with a silicone sleeve and drink-through lid. Now, you no longer have to drink your favorite wine out of a plastic cup, water bottle, etc. while outdoors at a concert in the park, picnic or camping. 1. Glass : the white glass is unique, chic and discreet. Glass preserves the taste and integrity of your wine. The glass is twice as thick than a typical wine glass making it durable and holds 17oz of your favorite beverage (ours happens to be wine). 2. Silicone Sleeve : The houndstooth-patterned silicone sleeve gives added durability, prevents heat transfer and provides a no-slip grip. 3. The Lid : The lid prevents your wine from spilling and keeps the bugs and sand out. You can drink your wine through the lid or simply take it off and use it as a regular stemless glass once you arrive at your outdoor destination. phthalate, lead-free and dishwasher safe. BEST ANSWER: The Goverre Portable Stemless Wine Glass is made of glass and is BPA free as well as phthalate free, lead-free and dishwasher safe. As far as I now it is not. I read up on it quite a bit before I got mine and did not see that it was. Is the lid also glass? BEST ANSWER: I believe the lid is actually plastic, with a rubberized rim to hold in place. It doesn't feel like cheap plastic at all though and depending where I am, I often just use the lid for transport and drink directly from the glass. Though love having the lid when at places like the beach, it doesn't affect the taste at all. Haha! I'd love to tell you! I gave this as a gift. I've never seen it. I ordered 2 more sets. Another for a gift, 1 for me. The last gift & mine have never arrived! This is an extremely laxidasical company?? Good luck! No, the lid is plastic and it seals really well. The lid is plastic. Durable plastic. Not glass. No, the lid is plastic. No. It is an actual wine glass. The glass is a bit thicker than usual ones. No, it is glass with a rubber sleeve over it. Is there a "trick" to drinking through the lid??? BEST ANSWER: The Goverre Portable Stemless Wine Glass (Turquoise) has a top which can be removed completely to enjoy your wine or, you can press the lid back on the glass and turn the top knob to the left to drink through the lid and turn the knob to the right to seal and close the lid. I actually end up taking the lid off. I use it for transport only. I don't think so but you do have to open it a bit. or red for client gifts to match my company colors. BEST ANSWER: Can order other colors threw govere. No black or white that I know of. Maybe wait a few months for govere to improve its manufacturing process. The Goverre Portable Stemless Wine Glass (Turquoise) area available in Blue, Green, Orange and Red. Has anyone else had trouble turning the knob to open the lid? I wanted it mainly for the drink through lid, but the knob doesn't turn at all and it's stuck in closed position. I'm wondering if I got a defective one or if it really is this hard to twist? 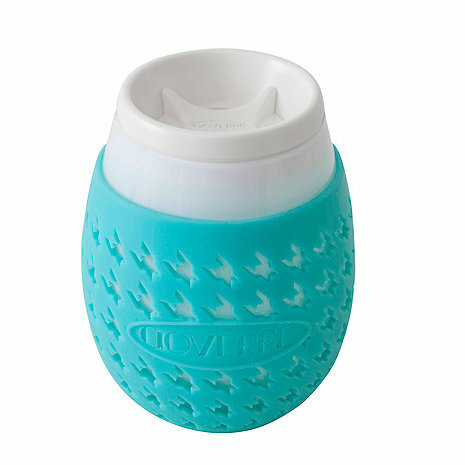 The Goverre Stemless Wine Glass (Turquoise) lid is designed to have a tight seal to prevent any leakage. The knob can also be totally removed to have greater access to the contents or to clean. So, while it should be a very snug fit, you should be able to untwist it with ease. I saw these on Shark Tank and ordered them immediately. I have used them a few times but they leak. Took red wine for the 4th of July and the wine spilled all over the inside of my cooler bag even though they were upright the whole time. Great idea but they don't work as advertised. They do hold half a bottle though. Maybe the Sharks can redesign the product so ithey don't leak. I am sorry I didn't return them. I like the product but would like it even more if the rest of my order would get delivered... been waiting over 90 days and have missed "gifting" them as I originally planned. I paid the entire amount through PayPal when I ordered so it's annoying to wait this long to get the goods. I was really excited to try these, but when I got it and tested it out, it leaked everywhere! Very disappointed. Unable to turn lid .I have to remove the top before drinking.I do not recommend this product. Also the price was very high. This is a great glass to take outside. It is glass, not a synthetic, so it could break, but the rubber material cushions, insulates, and protects it. Love the way the top seals so you don’t spill anything, which will also keep the bugs out.